I was going to say this tastes heavenly, but I don’t think that is the correct pun for it. Maybe that it truly belongs among the clouds? Naah, no good either. It is a good thing the Cloud City is a float? Bad punch lines, good punch though. It looks impressive, fizzes, bubbles and is very yummy. Jedi Master Heidi (whom you will hear more about in later posts – and without whose help and creativity the M4Ps [May the Fourth be with You Parties] would never happen), helped me figure out this recipe. It was (obviously) served it in (Han) Solo plastic cups! 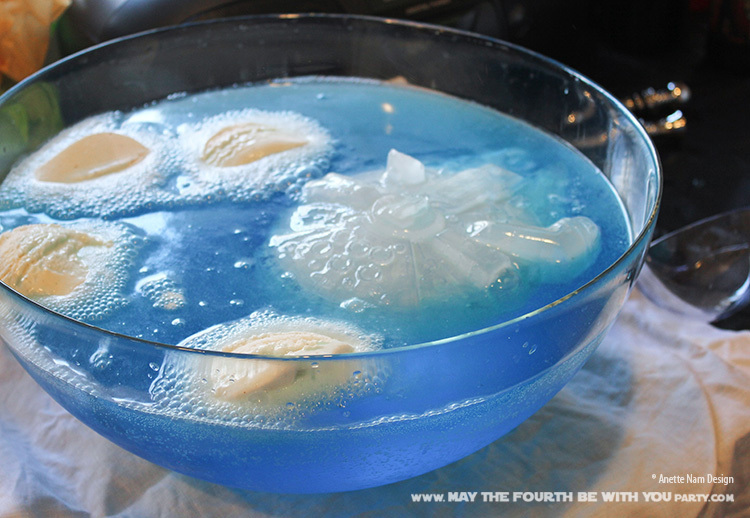 Make Millennium Falcon ice in freezer (day before). Pour in soda in bowl and mix in food coloring. 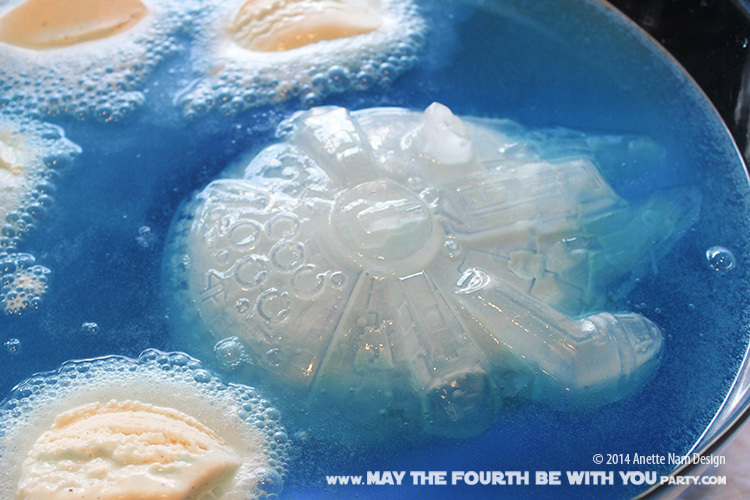 Add Millenium Falcon ice and large scoops of ice cream. Serve right away, so people get to see the fizzy fun. Here is a close-up of the ship – it lasted a LONG time. Just make sure all your soda is already cold when you pour it in. For an adult party, try adding vodka for an extra kick. You might want to start making the ice a couple of days before. It’s always good to have an extra ship in the freezer in case the first one melts faster than expected.